New Delhi: India’s retirement fund manager Employees’ Provident Fund Organization (EPFO) will invest at least Rs18,000 crore in stocks in the current financial year, adding fuel to a stock market that is already on fire. Labour minister Bandaru Dattatreya told reporters in New Delhi on Monday that his ministry is positive on more equity exposure because of the “encouraging returns" it has received over the last one-and-a-half years. EPFO functions under the Union labour ministry and started investing in stocks in August 2015. In 2015-16, it invested 5% of the annual incremental corpus in equities and in 2016-17, 10%. EPFO has an annual incremental corpus of more than Rs1.2 trillion and 15% of that will be at least Rs18,000 crore. “We have to increase the basket. The central board of trustees (CBT) of the EPFO is meeting on 27 May and we hope to reach a decision on this," said Dattatreya, who is also the chairman of the EPFO’s CBT, the apex decision-making body of the retirement fund manager. In April, CBT could not reach a conclusion on hiking the equity exposure to 15% of the annual EPF accruals as it was not part of the agenda. “We are making this part of the agenda this time," the minister said. The news could spur the ongoing bull rally. On Monday, BSE’s Sensex ended trading at 30,322.12 points, up 0.44%, and the National Stock Exchange’s Nifty at 9,445.4, up 0.47%. The Sensex, India’s most closely followed stock market index, was trading at 28,301.27 just three months ago. “...I believe there is a word of caution for everyone, including EPFO, as right now we are in a very high level of the market," said Prithvi Haldea, founder-chairman of Prime Database, which tracks equities. “There are two theories—one believes there is a lot of steam left in the market, hence (it is) beneficial to enter the market even now; and others feel equity market looks overvalued due to high demand and low supply. I tend to believe the second, though," he said. Dattatreya said his ministry has the option, provided by the finance ministry, to invest 15% of the annual incremental corpus in equities. “We have increased the equity exposure gradually. Now we can go from 10% to 15% in 2017-18," he said. EPFO invests in equities via exchange-traded funds. An ETF comprises a clutch of stocks that reflect the composition of an index, such as the Nifty or the Sensex, and is traded on the stock exchange. So far, the retirement fund manager has invested nearly Rs18,600 crore via ETFs run by SBI Mutual Fund, UTI Mutual Fund and the central public sector enterprises ETF run by Reliance Mutual Fund. 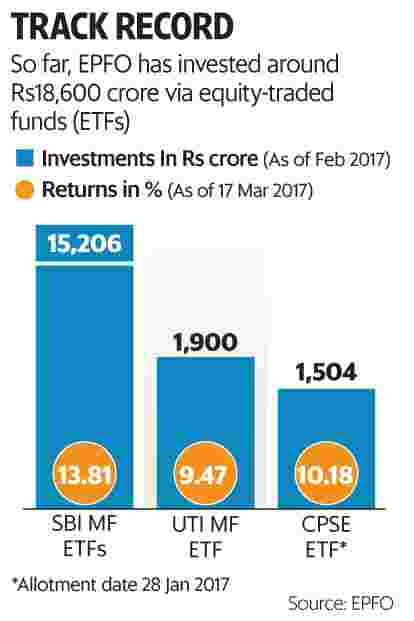 Dattatreya said the ETF investments have returned in excess of 13%. That’s higher than the 8.5% return the fund manager used to get from investing in debt instruments. He added that equity is a long-term bet that will reduce risks and return more. Interestingly, EPFO doesn’t have a policy guiding its exit from equity investments. “Though we are in equity for long term, it is better to have an exit policy to benefit from a bullish market if the fund managers feel so," said an EPFO official who declined to be named. This person added that this may be discussed at the next meeting of the CBT. Dattatreya said there was no problem because EPFO is being guided by expert agencies. Still, the plan to invest more in equities will face some resistance from conservative labour unions represented on CBT. The unions are chary of what they see as speculative investments. “EPFO does not have an exit policy yet, which means their equity exposure is not well thought thro-ugh," said D.L. Sachdeva, national secretary of All India Trade Union Congress and a CBT member. “I personally feel EPFO should give an option to workers on whether they want to invest a portion of their money in equity or not."